Excavation activities underway on the site. Secant pile wall construction before excavation. The soldier pile wall during excavation. 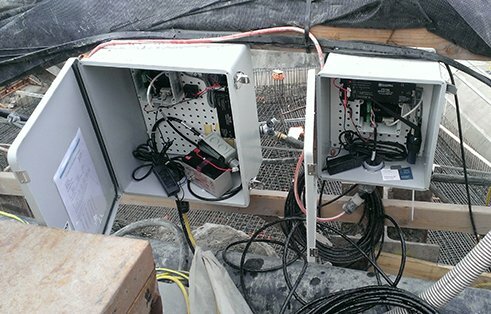 Monitoring equipment used on site. Construction activities underway on the project. The combination of a complex, highly sensitive laboratory building on soft ground with shallow groundwater led to unprecedented engineering challenges. The Allen Institute reclaimed historically industrial land in Seattle’s South Lake Union neighborhood for a state-of-the-art research center. The Institute’s facility is home to custom-designed robotic systems, automated technologies, laboratory space and high-powered computing hardware to process petabytes of data. Scientists will use the facility to study advanced neuroscience, learn how the human brain codes and processes information, and categorize and characterize the variety of cells in the brain. The facility is situated on reclaimed land within the historic shoreline of Lake Union that has seen more than 100 years of industrial use. The historic Ford and Pacific McKay buildings formerly occupied the site, and the new building preserved and incorporated the dealership’s historic facade. The finished building is a six-story research facility with four levels of below-grade parking and a below-grade loading dock. The combination of a complex and highly sensitive laboratory building on soft ground with shallow groundwater led to unprecedented engineering challenges. 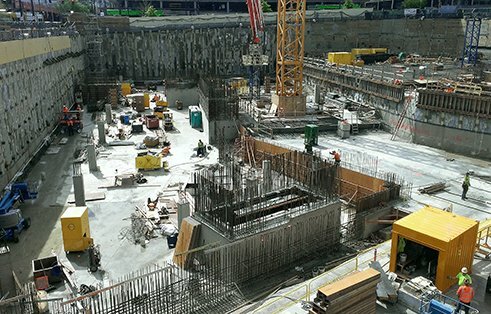 The new development extends more than 40 feet below site grades and more than 30 feet below the static groundwater table. GeoEngineers conducted a geotechnical engineering site investigation and dewatering assessment. 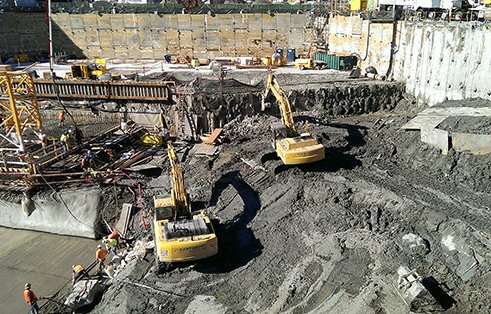 We also provided ground improvement design, along with geotechnical design of a temporarily anchored secant pile and soldier pile shoring system. 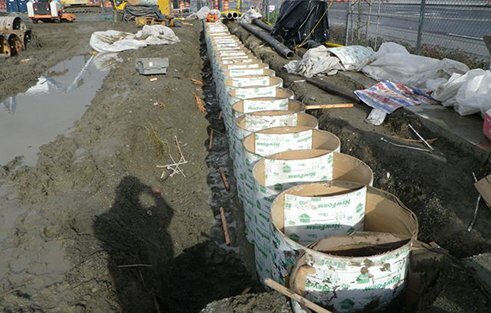 An anchored secant pile temporary shoring wall for the excavation that protected adjacent improvements from ground settlement and limited off-site drawdown of groundwater. An anchored soldier pile and lagging temporary shoring wall. Compaction grouting ground improvement to mitigate potentially liquefiable soils, targeting a localized loose sand layer present below planned foundation elevations. Additionally, the team used rigid inclusion ground improvement to mitigate settlement-prone soft soils along the western half of the building. 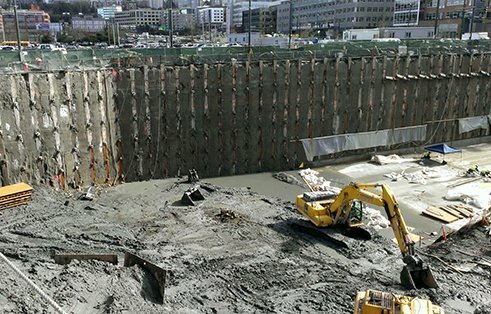 Below-grade walls and foundations extending more than 30 feet below static groundwater levels, including a relief drain system that enabled a safe design using a design groundwater elevation close to measured values. As part of the dewatering assessment, GeoEngineers developed a sophisticated 3-D numerical groundwater model to understand the factors that influence groundwater in the area and assess off-site drawdown of the groundwater table during dewatering. Ground improvement consisting of compaction grouting and rigid inclusions, to improve potentially liquefiable soils and to limit differential settlement between portions of the facility with foundations at differing elevations. GeoEngineers’ creativity, innovation and ability to process complex issues facilitated construction of this world class research facility. 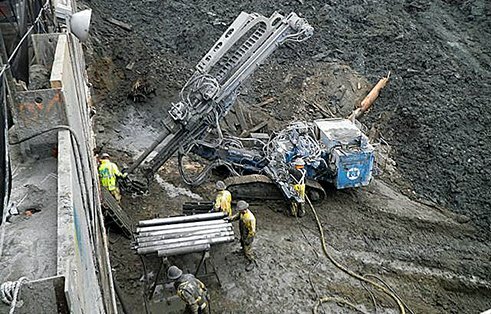 Extensive instrumentation and monitoring provided critical information on excavation performance, protected existing improvements, confirmed safe performance of the temporary dewatering system and optimized pumping requirements. GeoEngineers’ site investigation, geotechnical design and involvement during construction enabled contractors to successfully complete this important facility. The solutions and strategies employed on the Allen Institute are applicable to other projects in Seattle’s South Lake Union and other sites where similar soil and groundwater conditions are present. Honored with a 2016 Silver Best in State Award from the American Council of Engineering Companies (ACEC) Washington Chapter.